Method of Recruitment : By deputation. Eligibility Criteria: Officers under the Central Government or State Government or Union Territories or Statutory Organisations holding analogous post or with eight years regular service in post in the scale of Rs. 4000- 100-6000 (5th CPC)/PB-1 Rs. 5,200-20,200/- + GP Rs. 2400/- (6th CPC) corresponding to pay scale of Rs. 25500- 81100/- (Level 4) of the 7th CPC Pay Matrix or equivalent. 1. Application in prescribed format duly completed, signed by the applicant and countersigned by the Cadre/Appointing authority. 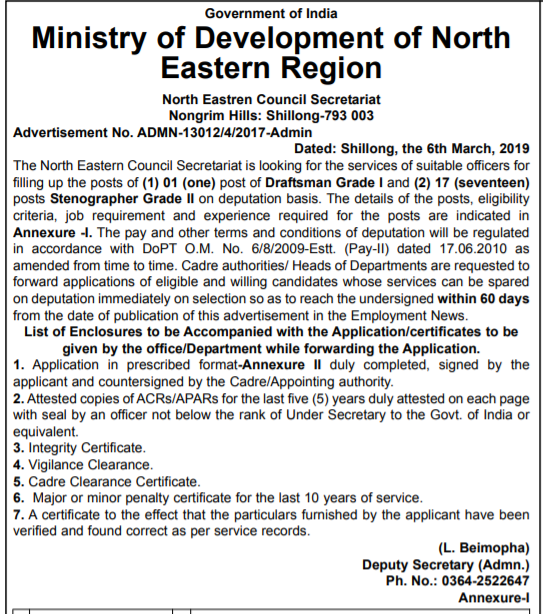 DISCLAIMER: We took this information from “ EMPLOYMENT NEWSPAPAER” Published on 30 March To 5th April 2019 on the page Number 7.